In this Miami mansion, burrowed inside the quaint Venetian Islands, it’s all about the hits. 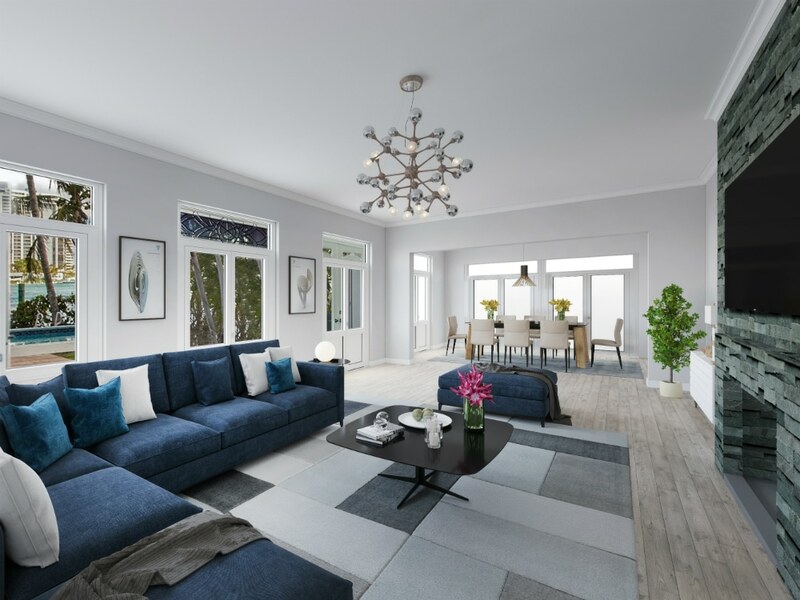 Homeowner Tom Lord-Alge, esteemed American music mixer and Grammy Award Winner, listed the property for the first time in over 20 years with Sladja Stantic and Dina Goldentayer of Douglas Elliman’s Sports & Entertainment Division. 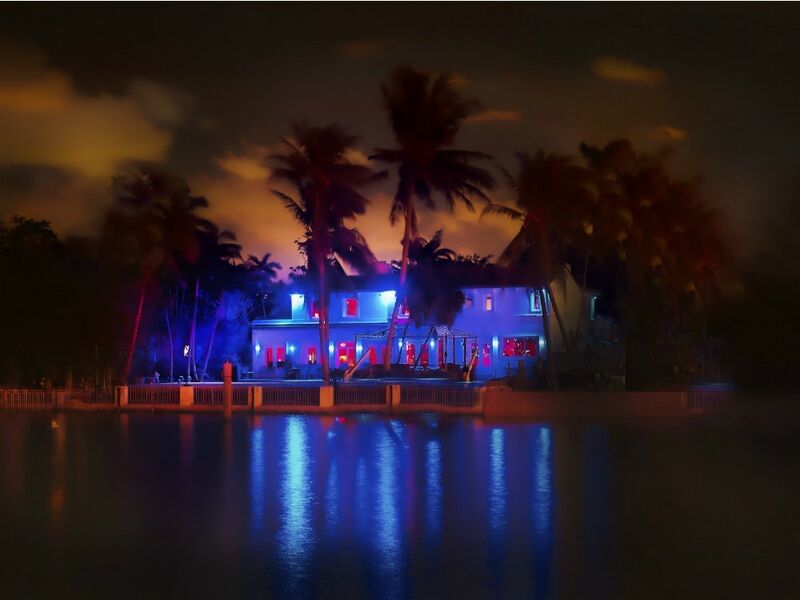 Between hosting pop stars such as Lady Gaga and the Hanson brothers, to throwing the opening party for Miami’s Ultra Music Festival for four years, it is easy to see how the Blue House has been dubbed an escape for icons in the Magic City. So, we sat down with Sladja Stantic of Douglas Elliman and Tom Lord-Alge to get the scoop on this legendary home and give our Ocean Drive readers a private tour. Sladja, can you tell our Ocean Drive readers about the infamous "Blue House." 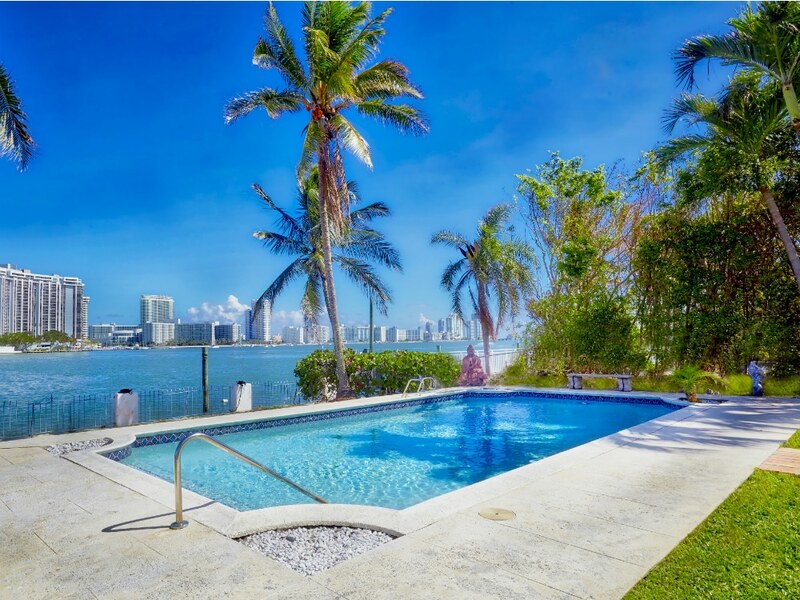 What can South Florida buyers expect to see in this Venetian Island mansion? Sladja Stantic: The Blue House is dubbed as an escape where icons can have fun and work in a relaxing environment. The property features a grand circular driveway rarely seen anywhere in the neighborhood, which adds to the anticipation of getting to the front stairs. Upon the entrance, there is a guest book to sign-in—Tom is very selective on who he invites into his home. Entertainment with endless bay views is found throughout the property. There is a full bar in the living room, the dining room was turned into pool table room where you can find an amazing collection of Tom's work, and of course, the infamous Spank Studio where the magic happens. Unfortunately, the studio does not come with the home. 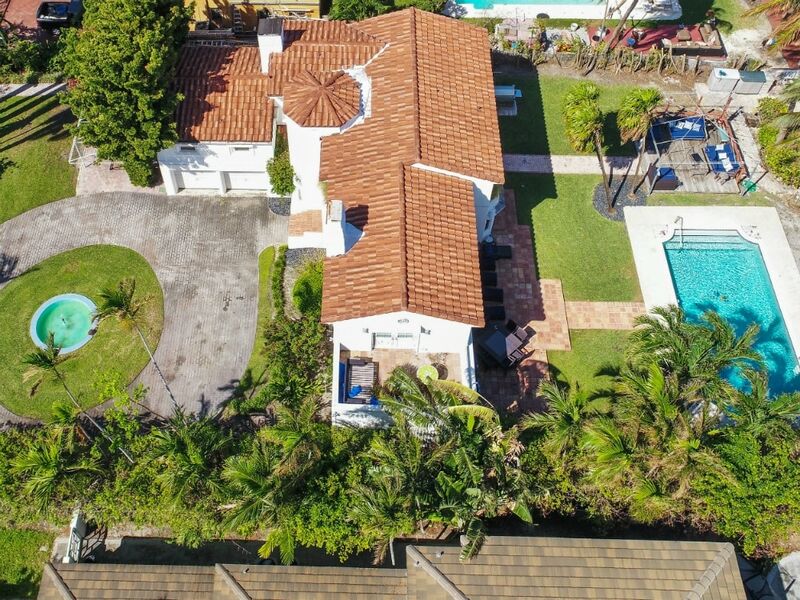 Owned by Miami music mixer and Grammy Award Winner Tom Lord-Alge, what sets this home, apart from other homes on the Island? SS: When Tom came to South Beach back in the ‘90s, he had specific requirements that needed to be met when it came to purchasing his future waterfront home. As a boater, waterfront exposure was a must and he picked the best. With exposure to the east, this over-sized lot located on Venetian Islands, features 90 feet of water-frontage allowing easy access to the bay without drawbridges. The exterior is ideal for a boater that looks for seamless access to the bay where they can hop on their boat grab dinner nearby, or cruise around with a drink in hand. The views are endless. Enjoy a morning breeze or take in the South Beach skyline at night. Are there aspects of the home that lend homage to Alge's music career? And the Grammy Award-winning albums that were produced there? SS: When Tom moved 20 years ago to Miami Beach and decided to live on the Venetian Islands, he was specifically attracted to the area’s exclusivity. The time he gained by not having to sit in LA traffic and the fact that he could work while feeling like he was on vacation was the lifestyle he was looking for. Coincidentally, those same attributes attracted many bands to work at the Blue House, as it was a perfect balance of work and play. They were offered an opportunity to enjoy endless summers, bay views, cocktails and studio hours all from the same location. Tom mentioned to me on many occasions that when you truly love where you live, it adds a certain kind of magic and that directly affects how your life works out. Based on his Grammy Awards count, it is safe to assume that his love toward the Blue House was a special one. How much is the Blue House on the market for? SS: Everything is unique about the Blue House, including the price. We are $1 short of $7M, it is on the market for $6,999,999. Tom Lord-Alge: I always wanted for my house to look like a concert stage with blue lights, so after a few cocktails one night, my brother Mark and I decided to put up some lights I had laying around. A few days later, I remember driving over the bridge, and looking at the house thinking that we needed more. So, I kept adding and my vision of having my house look like a concert stage came to life. I can't pinpoint the exact moment when we named it the Blue House, but it was a natural transition. Seeing the likes of stars for over 20 years, who were some of your favorites that visited there and produced there? TLA: I don't play favors…just kidding; I loved visits from Marilyn Manson, Pink. And Hanson. Quite a variety, very different characters and work style. What is your favorite memory of the Blue House? For four years, the opening party for Ultra Music Festival was held at the Blue House and even though there were plenty of spaces where drinks were served, one of my friends arranged to have a two story, 80-foot tiki barge set alongside my dock, which became the main bar. That turned out to be amazing. Another one, is when Lady Gaga came over for a session accompanied by her security team. While I would open up my house for large groups when parties were thrown and aside from my close friends and immediate family, nobody knew what was going on at my home, nor did they have an idea of who was coming or leaving, when it came to work. So, 20 minutes after Lady Gaga walked in, I remember my very good friend and neighbor barging in upset after he got into a verbal fight with one of her security guards and came in saying "nobody other than you, can tell me when to come or leave the Blue House." He didn't see celebrities as celebrities; most of my friends just see them as a hard working bunch that happen to be known worldwide. What is one secret about the Blue House, that you can tell our Ocean Drive readers? TLA: When the Hanson Brothers were in the studio, they would smoke cigars, even though they were 16 at the time. I understand that the profession is stressful. Your perfect Miami buyer, who would that be and why? TLA: There has been an enormous change of landscape on the Venetian Island for the past 20 years. While I love my home, and have enjoyed every minute spent here, I am realistic that there is a great chance that my perfect buyer will be someone who sees the value in owning one of the only 16 oversized lots on Venetian Islands where they can build their spacious dream home vs being limited on any other regular size lot. However, I would not mind getting a romantic who would take time to improve and add to the existing home, as there is great potential and history here.